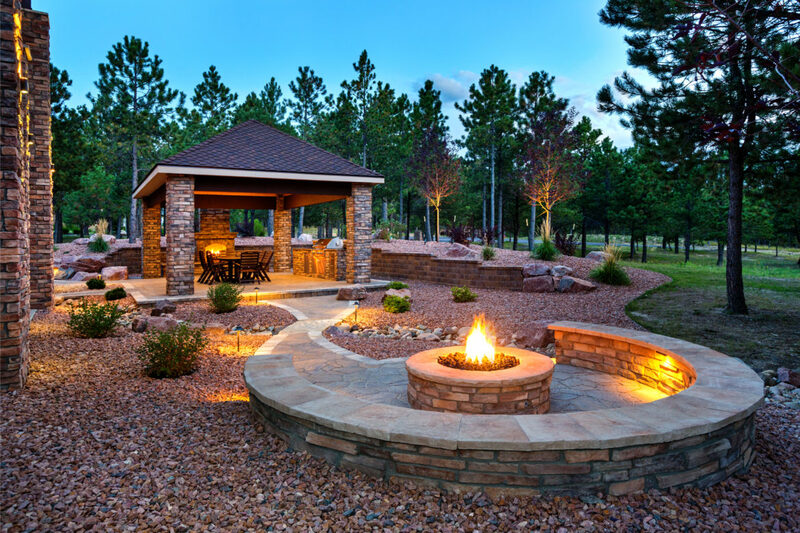 Nothing about your dream home should be ordinary, and that includes your outdoor spaces. Patios, pools, gardens, walkways, driveways, and outdoor kitchens are only a few of the spaces that can be designed as an extension of your luxury home. Renovations aren’t only about interior design—they’re also about creating inviting living spaces around your home’s natural landscape. At Gerety Building & Restoration, we have decades of experience helping homeowners in Westchester and Fairfield counties realize the dreams they have for their ideal backyard, garden, courtyard, or terrace. Here are some of our favorite strategies for turning your outdoor spaces into stunning conversation pieces that are as functional as they are beautiful. A patio should be inviting and comfortable, not to mention visually appealing. When you consider the range of uses for a patio, you realize just how versatile this space should be. Well-crafted custom patios create one-of-a-kind outdoor spaces for relaxing and entertaining. They should combine aesthetics and practicality to create a fun yet functional section of your home. Keep in mind that in Westchester and Fairfield counties, a patio should also be able to be winterized—a practice we specialize in. Some designers only consider the project in terms of what they need to build or construct. We like to take it a step further. Collaboration is a huge part of design-build contracting, which means we work closely with both your architect and/or designer to ensure your renovation keeps the design in mind throughout the construction process. The design of your patio should work together with the appearance and style of the furniture you plan to incorporate. Do you want to create a rustic cottage look on your patio? Something farmhouse chic? Maybe you love mid-century modern designs and want to feel like you’re stepping into the past. Today’s technology allows even those of us in New York State the chance to have an outdoor kitchen that is usable through multiple seasons. Whether you want a simple summer kitchen to grill up the basics or a gourmet setup where you can prepare meals with as much versatility as in your main kitchen, a luxury outdoor kitchen makes a statement that impresses your guests. When it comes to renovating your outdoor spaces, constructing a pool is a major consideration—and with any great outdoor pool comes an even more phenomenal pool house. One of our favorite renovation projects to date was this stunning one-of-a-kind timber frame pool house, featuring beautiful Northern White Pine and Pennsylvania Ashlar Stone. When you aren’t swimming laps or hanging in the pool house, what better way to enjoy the outdoors than by settling in on the deck? 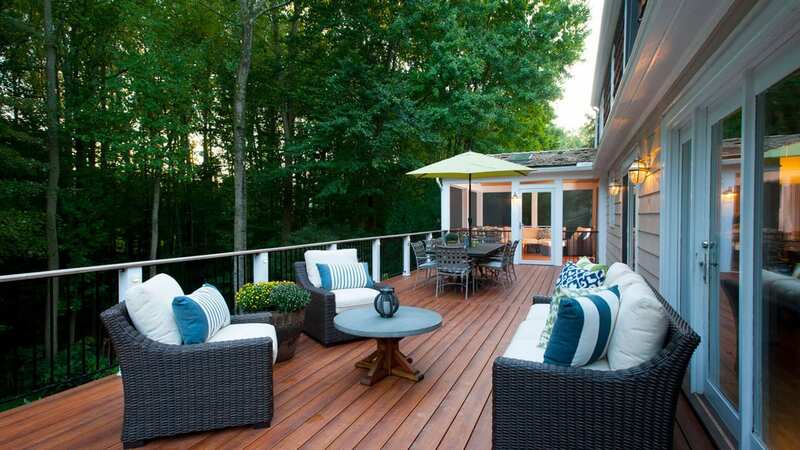 With the right construction, your deck can be an incredibly versatile space year-round. Take this screened in porch we built in Salem, New York. 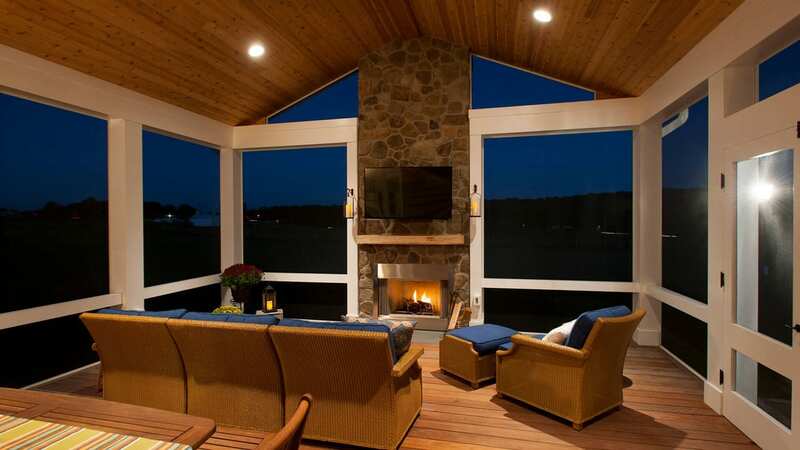 The warm mahogany deck is a year-round invitation to relax, and in the cooler months, the stone fireplace will be sure to keep you and your guests the perfect temperature. If you’re interested in seeing more of our luxury renovations, you can check out our Portfolio page, but we’re always just a phone call away! Feel free to reach out if you’re interested in talking out some of your outdoor renovation ideas—we’re happy to give you an expert perspective.